More than 1,400 people were injured and at least 128 were missing after the killer waves slammed into western Java and southern Sumatra without warning Saturday night, smashing homes to pieces and sweeping locals and Christmastime tourists into the sea. Hundreds of military personnel and volunteers searched along debris-strewn beaches. Where victims were found, yellow, orange and black body bags were laid out, and weeping relatives identified the dead. The waves followed an eruption and apparent landslide on Anak Krakatau, or “Child of Krakatoa,” a volcanic island that formed in the early part of the 20th century near the site of the cataclysmic 1883 eruption of Krakatoa. Hotels and hundreds of homes were heavily damaged by the waves. Chunks of broken concrete and splintered wood littered coastal areas. The Indonesian Medical Association said that it sent doctors, medical supplies and equipment, and that many of the injured were in need of orthopedic and neurological surgery. It said most victims were Indonesian tourists visiting beaches during the long weekend ahead of Christmas. 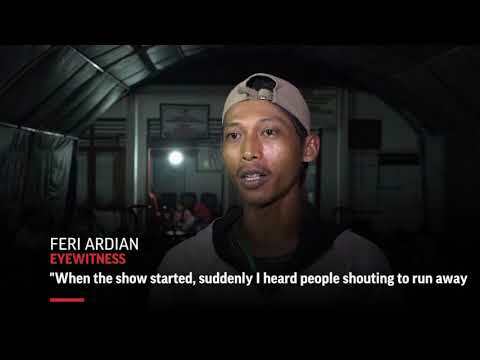 Video posted on social media showed the Indonesian pop band Seventeen performing in a tent on Tanjung Lesung beach at a concert for employees of the state-owned electricity company when a wave smashed through the stage. Seventeen’s bass player, guitarist, drummer, road manager and technician were all killed. The lead singer survived, but his wife, a backup singer, was missing. Sutopo Purwo Nugroho, spokesman for Indonesia Disaster Mitigation Agency, acknowledged on Twitter that the country’s network of detection buoys had been out of order since 2012 because of vandalism and budget shortfalls. But the head of Indonesia’s Meteorology, Climatology and Geophysics Agency, Dwikorita Karnawati, said the tsunami was caused by Krakatau’s volcanic activity and so could not have been picked up by her agency’s sensors, which monitor the conventional earthquakes responsible for more than 90 percent of Indonesia’s tsunamis. The tsunami was probably caused by the collapse of a big section of the volcano’s slope, said Gegar Prasetya, co-founder of the Tsunami Research Center Indonesia. The 305-meter (1,000-foot) Anak Krakatau been erupting since June and did so again 24 minutes before the tsunami, the geophysics agency said. The eruption of Krakatoa in the 19th century killed more than 30,000 people and hurled so much ash that it turned day to night in the area and reduced global temperatures. A quake and tsunami that hit Sulawesi island in September killed over 2,100 people, with thousands more believed swallowed up by the earth. A magnitude-9.1 earthquake struck Indonesia on Dec. 26, 2004, spawning a giant tsunami off Sumatra island and killing over 230,000 people in a dozen countries.